Eris is at present ten years old. He is doing well and in good health. 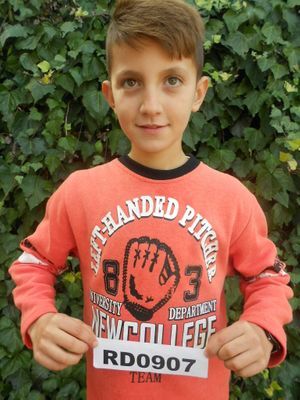 Eris is attending the fifth grade at school in Rodokal and to attend he needs to walk for at least forty five minutes. He walks together with the other children who attend school from Low Rodokal. Eris likes to study and his favorite subject is Math. He spends his free time playing football but not too much recently and this is due to the bad weather. His favorite color is blue. His future dream is to be a mechanic as he loves driving cars and fixing them. Eris attends regularly twice a week, every Monday and Thursday our feeding program at Rodokal, enjoying the combined meals cooked and served to the participating children. He likes the fried chicken, sausages, pasta and rice served by our cooks. Eris attends the Bible classes for the children who are same age with him and enjoys singing to praise the Lord Jesus and learning from God’s Word. At the end of the Bible lesson, he and the other children spend time to play at our feeding centre under the care of our teachers. He also has the possibility to gain a free dental care offered at our dental clinic in Kotodesh. Eris has his father, mother a brother and a sister. His brother Endi is attending our feeding programme. He is fifteen years old and attends the first grade high school in Rodokal. Erestina is his twin sister. She was also regisitered recently and attends our program. Erestina attends the same class at school with Eris. The father of Eris is emigrating in Greece and there he works eight months each year as hired to provide for his family. The amount he receives is a secure income to provide what is needed the most in his family. Same as all families in the village, they own land and have planted wheat. They use it to make their bread at home. They also keep a cow to at least provide some milk and other products for self consumption. The stock food for the cow is provided through the land. The mother of Eris does the housekeeping and works at her vegetable garden.